I discovered Nicole Krauss’ ‘The History of Love‘ around ten years back. I was discussing favourite books with one of my friends at that time and she said Krauss’ book was one of her top five alltime favourites. I made a mental note to read it at some point. When our book group decided to read it this month, I was so excited. There are three story arcs in ‘The History of Love‘. The first one is narrated by a man in his eighties, Leo Gursky. He is Jewish and he moved from Poland to America during the Second World War to escape from the Nazis. The girl he loves moved to America before the war started. He hopes to catch up with her, get married to her, and live happily ever after. The Leo Gursky of today, narrates what happened. The second story arc is narrated by a teenage girl, Alma Singer. She lives with her mother and younger brother. Her father is no more. Her mother continues to grieve for her husband while the children grieve in ways that they don’t even realize. 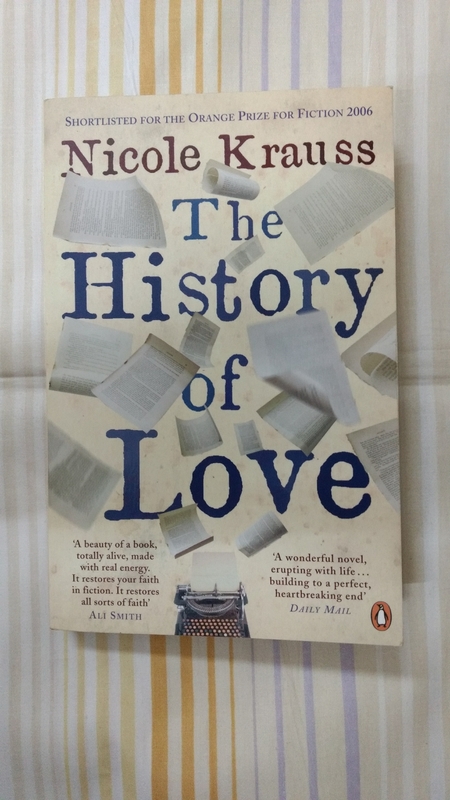 One of the things that Alma talks about is a book called ‘The History of Love’ written by a mysterious writer called Zvi Litvinoff. The third story arc is about the writer Zvi Litvinoff and how he came to write this book. How the three arcs come together and get woven into one fabric and how this mysterious book binds them together, forms the rest of the story. There was a time in the middle and late 2000s, say from around 2002 to around 2010, when there was an explosion of novels of a particular kind. It was hard to classify them – they were not love stories or murder mysteries or historical novels or literary fiction, though they had elements of some of these. Because they were hard to classify, they were called ‘Contemporary Fiction‘. They were written in prose which was accessible but also beautiful. In some of these stories, the narrator was a young character, maybe a teenager or sometimes even a pre-teen. But these books were not written for teenagers or pre-teens. They were written for grownup readers. Books like The Curious Incident of the Dog in the Night Time, Extremely Loud and Incredibly Close, The Secret History, The Dante Club, The Piano Tuner, Special Topics in Calamity Physics, The Selected Works of T.S.Spivet, The Shadow of the Wind, The Memory Keeper’s Daughter, The Time Traveler’s Wife, The Lovely Bones, The Book Thief. Many of these books were written by first-time writers and they received great acclaim. Some of these writers followed up with a second book which was less acclaimed. Most of these writers faded away after that. Some of the writers continue to publish today, but their works mostly fall below the radar. I don’t know whether this is how things happened. Or whether I am taking a collection of random facts and weaving them into my own fictional narrative. But this is how I look at it. Nicole Krauss was one of those writers. And ‘The History of Love‘ was one of those books. Nicole Krauss’ book has many of the elements of the books that came out during its time. It has a teenage narrator, it has some history woven in, the prose is accessible but beautiful, there is an underlying mystery in the story, and the ending is not simple and it makes us contemplate. There are digressions from the main story in which the narrator talks about life in the deepest parts of the ocean, how to find out whether a forest plant is edible, evolution, and other topics which are quite interesting to read. There are also direct and implied literary references to Kafka, Isaac Babel, Isaac Bashevis Singer which are fascinating to read. I discovered a new book because Alma Singer gushes about it – ‘The Street of Crocodiles‘ by Bruno Schulz. I want to read that now. I loved the two narrators of the story. Their voices are very different and Krauss brings them authentically alive on the page. Leo Gursky has the wisdom and the humour and the kindness and the devil-may-care attitude of a person of his age, while it is hard to resist comparisons between Alma and her more famous literary cousin, Scout, from Harper Lee’s ‘To Kill a Mockingbird‘. I loved the fact that there is a book behind the story and it weaves all the plot strands together. “She’s kept her love for him as alive as the summer they first met. In order to do this, she’s turned life away. Sometimes she subsists for days on water and air. Being the only known complex life-form to do this, she should have a species named after her. Once Uncle Julian told me how the sculptor and painter Alberto Giacometti said that sometimes just to paint a head you have to give up the whole figure. To paint a leaf, you have to sacrifice the whole landscape. It might seem like you’re limiting yourself at first, but after a while you realize that having a quarter-of-an-inch of something you have a better chance of holding on to a certain feeling of the universe than if you pretended to be doing the whole sky. ‘The History of Love‘ is about love, family, relationships, history and how these things can come together and become literary art. I loved it. I am happy to report that Nicole Krauss was one of the writers of her time who didn’t fade away – her newest book came out last year, though it looks like it was very much below the radar. I can’t wait to read more books by her. Have you read Nicole Krauss’ ‘The History of Love‘? What do you think about it? I have a Valentine’s Day tradition every year. I take out some of my love story collections and dip into them. I try to read one or two stories, typically the shorter ones. 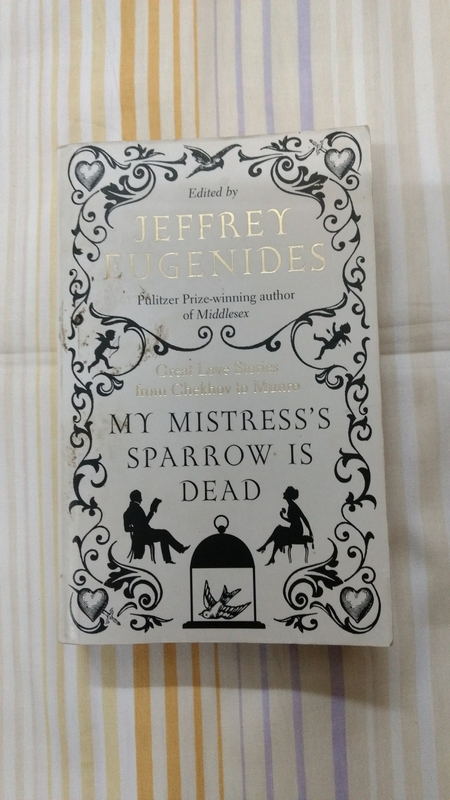 One of the books I dipped into was this one – ‘My Mistress’s Sparrow is Dead‘ edited by Jeffrey Eugenides. Across the years, I had finished reading the other love story collections. This year on Valentine’s I did what I did every year – took out this story collection and thought I will read one or two stories. But, after I read two stories, I decided to read one more, and then another, and then I decided to read the whole book. It took me a few days and I finished reading it yesterday. Before I continue with the book, I want to share some thoughts on love stories. In my experience, there is one kind of love story, which most of us like. It describes two people falling in love at first sight, having good romantic times together and then they face challenges – rival suitors, disapproval of parents and community – and our two lovers fight it out and find happiness in the end. Or sometimes they don’t and the story has a sad ending. There are variations of this plot – the two people might be from different communities, ethnicities, and even different generations. They might end up in a high pressure dangerous situation which brings them together and opens their hearts to each other. This is the kind of love story most of us like. Stories like ‘Romeo and Juliet‘ or ‘The Gift of the Magi‘. We can call it the classic love story. There is a second kind of love story. This is the kind of story which seems to be favoured by literary magazines these days. This kind of love story describes how things are in the real world. Or atleast close to it. There is no love at first sight, no great romantic moments and challenges faced, twists and turns in the story etc. In this kind of story, a couple has a long conversation in front of the TV or they bicker about their respective families. Sometimes two married people have an affair, but the affair is described realistically. This is the second kind of love story, the contemporary love story. ‘My Mistress’s Sparrow is Dead‘ has stories of the second kind. If you are a person who likes the first kind of love story, but not the second kind, this book is not for you. ‘My Mistress’s Sparrow is Dead‘ has twenty six stories. Many short story masters are featured – for example, Anton Chekhov, Guy de Maupassant, George Saunders, Raymond Carver, Alice Munro. Some classic stories are featured – for example, ‘The Lady with the Little Dog‘ (Anton Chekhov), ‘A Rose for Emily‘ (William Faulkner), ‘What We Talk About When We Talk About Love‘ (Raymond Carver). Most of the stories are short, ranging from two or three pages to around twenty pages. Some of the stories are long – more than thirty pages. I counted six of them. There is a beautiful introduction at the beginning of the book by Jeffrey Eugenides, in which he describes why the collection has this particular title (it refers to a couple of love poems by the Roman poet Catullus), what he means by ‘love stories’ and why he chose these particular stories. I loved the introduction. So, what about the main book? What do I think about it? Well, there is good news and bad news. The good news first. I loved some of the stories in the book. Like absolutely loved. For example, ‘The Lady with the Little Dog‘ by Anton Chekhov. I had read it before, but had forgotten the story. When I read it again this time, it pressed all the right buttons. It is about two married people who are having an affair. The plot is interesting, but the insights into life are amazing. The prose is vintage Chekhovian, very Russian. The beautiful passages sizzle and leap out of the page. From a writing perspective, it is an education on how to write a short story. People have raved about Chekhov for nearly a century now. This story shows why. The second story I loved was ‘Mouche‘ by Guy de Paussant. In this story, five young men love the same woman. And she loves them all back. What happens after that is the story. It is a beautiful story. The third story I loved was ‘Yours‘ by Mary Robison. I had read it before. This is probably the third time I am reading it. It was still as wonderful as the first time. It is just three pages long. In the third page, there is a surprise, that we don’t see coming. And the whole story is very beautiful. It shows how much magic a master can create even in three pages. How to be an Other Woman by Lorrie Moore – the affair story told from the other woman’s perspective. It had an interesting twist in the end. Jon by George Saunders – set in some kind of future world where a couple struggles between a predictable, safe but constrained life and a free, uncertain life which they can opt for. Fireworks by Richard Ford – a story about the day in the life of two people in love, when an old lover turns up. First Love and Other Sorrows by Harold Brodkey – about exactly what the title says. Spring in Fialta by Vladimir Nabokov – Nabokov’s prose, is elegant, as always. He mocks at readers like me with his vocabulary, by writing phrases like this – “in the lacquer of its elytra a gouache of sky and branches was engulfed“. He also can’t resist taking potshots at modernist writers of his time – “Now, frankly speaking, I have always been irritated by the complacent conviction that a ripple of stream consciousness, a few healthy obscenities, and a dash of communism in any old slop pail will alchemically and automatically produce ultramodern literature; and I will contend until I am shot that art as soon as it is brought into contact with politics inevitably sinks to the level of any ideological trash.” Phew! The Bear Came Over the Mountain by Alice Munro – halfway through, I thought this will be one of my favourite stories. I wish the ending had been what I had expected. So, now that the good news is out of the way, what is the bad news? Out of the twenty six stories, only seven are by women writers. That is bad representation. The collection has a heavy Anglo-American bias. Twenty three of the stories were originally written in English. Only three of the stories were originally not written in English – the stories by Chekhov (of course! ), Guy de Maupassant (of course!) and Milan Kundera (interesting!). But these are problems which are there in any short story anthology. The bigger problem for me was that except for the three stories I loved, none of the other stories leapt at me, none of them made me laugh and cry, none of them gave me emotional highs and lows. I expect these from a love story, even the heavily intellectual ones. Fortunately, most of the stories were readable and were interesting. There was only one story which I found very hard to read, ‘Innocence’ by Harold Brodkey. It went on and on without any point and at one stage, I started flipping through the pages and reached the last page. Eugenides describes the story as scandalous in his introduction, and it probably was at the time it was written in the early ’60s, but now, it was a hard read for me. So, what is the final verdict? Well, ‘My Mistress’s Sparrow is Dead‘ is an interesting book. I love the first type of love story, the classic one. I don’t mind the second type of love story now, though there was a time, say around ten years back, when I would have found it hard to read. Because of that, I didn’t love the book overall, though I loved some of the stories. But I would say that the book was a good read. If you are a fan of the classic love story but not a fan of the contemporary version, this book is not for you. But if you like contemporary love stories and are used to reading them in literary magazines, you will love this book. Have you read ‘My Mistress’s Sparrow is Dead‘? What do you think about it? Which is your favourite love story collection? This was a book that I was looking forward to very much last year – it had a beautiful cover, it had short stories by Scandinavian authors, it was a new collection, it was perfect winter reading. But I could get into it only last week, and I finished reading it today. ‘The Dark Blue Winter Overcoat and other stories‘ has eighteen short stories. Authors from countries which are the usual suspects are featured – Sweden, Denmark, Norway, Finland, Iceland. The interesting thing though is that authors from some of the lesser known islands are featured too – Faroe islands, Åland islands, Greenland. One of the Norwegian writers featured belongs to the indigenous Saami community. There is also a Finnish writer featured who is originally from Iraq. That is lots of diversity in a small book and it is pretty impressive. I had heard of only one writer featured in the book, Per Olov Enquist. His story was one of my favourites. I might have heard of another writer, Dorthe Nors too, but I am not sure. So, I discovered atleast sixteen new writers because of this book, which is a wonderful thing. My favourite stories from the book were these. The Man in the Boat by Per Olov Enquist – Two boys make a raft without anyone knowing and they take a trip in the lake. Then strange things happen. The story was about the carefree nature of young people, the innocence of youth and how that innocence is lost because of sudden and surprising life experiences. I loved the nod to Greek / Pagan mythology in the story. The story had a poignant, heartachingly beautiful ending. The Author Himself by Madame Nielsen – The narrator of the story meets her favourite author Peter Høeg once, and the story tracks the narrator’s own life between the encounters she has with Peter Høeg across time, either personally or through the news. 1974 by Frode Grytten – This depicts events in a short period in the summer of 1974. It made me remember ‘To Kill a Mockingbird‘. There were some beautiful passages in this story. San Francisco by Niviaq Korneliussen – The narrator has a tragic event happen in her life and suddenly ends up in a new country with her not remembering how she got there. The story narrates events of the present in which the narrator survives because of the kindness of strangers and also looks back into the past and we learn what actually happened. A very beautiful, poignant story. I also liked ‘A World Apart‘ by Rosa Liksom, in which the short story was divided into chapters, each of which was a short story in itself, ‘Zombieland‘ by Sørine Steenholdt, in which the narrator has a tough life because of her mother, “Don’t kill me, I beg you. This is my tree” by Hassan Blasim, which depicts an immigrant’s life in Finland and also shows how it is not always possible to run away from the past, ‘The Dark Blue Winter Overcoat‘ by Johan Bargum, in which the narrator’s father starts behaving like a dog (I don’t know whether it was a take on Kafka’s ‘Metamorphosis‘) and ‘Sunday‘ by Naja Marie Aidt, which had an interesting surprise in the end. There is also an interesting interpretation of the Norwegian fairytale, ‘East of the Sun, West of the Moon‘, called ‘The White-Bear King Valemon‘ by Linda Boström Knausgaard. I liked ‘The Dark Blue Winter Overcoat and other stories from the North‘. Some of the stories were straightforward reads, while others were more challenging and had to be read closely and carefully. I am glad to have discovered so many new Scandinavian writers through this book. I can’t wait to explore some of their longer works. This book also has an introduction at the beginning, in the form of a conversation between the editors. It is a beautiful, interesting introduction to Scandinavian literature. “In the year 1974 my father started attacking his own family. In 1974 I waited for phone calls from a crazy girl who I knew was going to drop me the minute she got tired of me. But that’s how it is, that’s how you lose a city, and it’s only afterwards that you can write the story. When you’re in the middle of it, you think everything will stay the same, everything will remain the way it is, just a little bit different. Then you’re standing there one day on the empty street when you’ve come home after having been away for a long time, and you meet people you don’t know, or people you don’t recognize. The grey factory buildings and the grey mountains are the same as they have always been. But everything has changed and the workers don’t walk through the gate to punch the clock any more. That’s how it happens : first your best friend loves, then you move, then they shut down the smelting works, then there’s a whole gang of men nobody needs, and then the radio stations don’t play the records you like any longer. Then they ship the entrails of the factory to Poland, China and Argentina, and then they start arguing about what’s going to happen to the shells of the buildings that have started falling down. The benches are empty, there’s no longer water in the fountain outside city hall, and the neon lights on the cinema have stopped working. 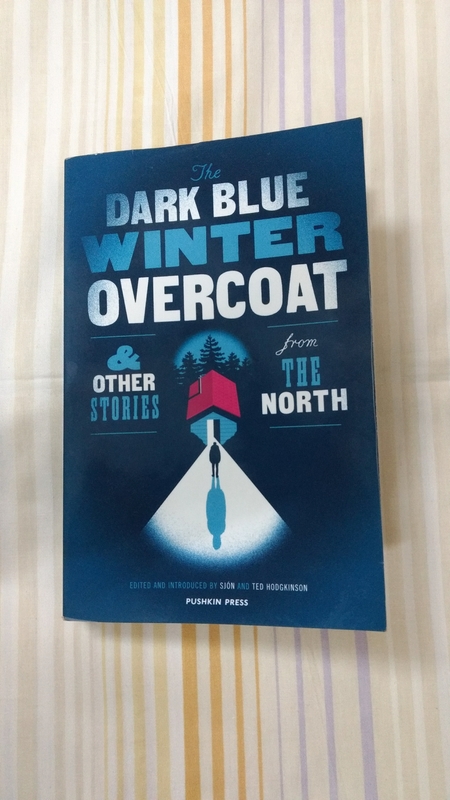 Have you read ‘The Dark Blue Winter Overcoat and other stories from the North‘? What do you think about it? 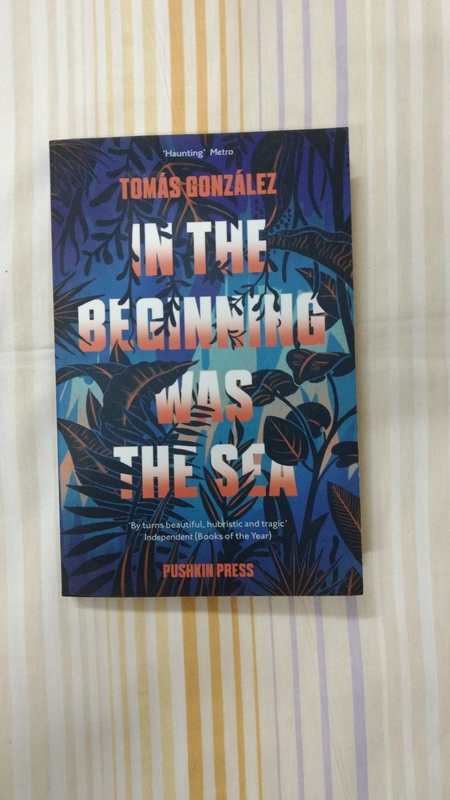 When I read the storyline of Tomás González’ ‘In the Beginning was the Sea‘, I was tempted to read the book. The story told in the book goes like this. J. and Elena are a couple who live in the city. One day, they decide that they have had enough of city life. They wrap things up, buy a house in a distant island and move there with their meagre possessions – a couple of suitcases, a box filled with books and a sewing machine. They face challenges while moving – simple things like, the sea doesn’t look as beautiful as they imagined it to be when they board the boat, the house they bought is in bad shape, and other things like that. But they work hard, accept their new reality, and try to make it work. After all, isn’t that what life is? We try to escape from things and then we discover that the new reality is not what we imagined it to be. Then we just bite our tongue, put our heads down and work hard to make things better. Things go well for a while. They have a good person who works for them and helps them, this person’s wife becomes their cook and she makes delicious food, the people in the village in the island are warm and welcome them, and life looks good. J. adjusts to the new reality quickly, but Elena finds it hard, and it takes time for her to get used to the new life. And then small irritants start cropping up. And then the irritants become challenges and they get bigger and increase more and more in number, till they become a deluge. As Shakespeare says in ‘Hamlet‘ – “When sorrows come, they come not single…but in battalions“. And before long, the water has gone over the head and J. and Elena are trying hard to stay afloat. There is a romantic notion that if a person moves away from the chaotic life of the city to a forest or an island and lives a simple life at one with nature, it is beautiful and desirable and the best thing that a human being can do. Across the decades and centuries many writers and intellectuals have propounded this thought and raved about it. Henry David Thoreau gushed about it in ‘Walden‘. Somerset Maugham raved about it in atleast three stories – ‘The Fall of Edward Barnard‘, ‘The Razor’s Edge‘ and ‘The Moon and Six Pence‘. I read those three and wanted to move to an island when I was a teenager. Tomás González takes that romantic notion and turns it upside down in ‘In the Beginning was the Sea‘ and tries to show what happens when a city person actually moves to an island. He paints a realistic picture, and shows the nice and the not-so-nice things, the challenges and the rewards. It is beautiful. González’ prose is spare and there is no unnecessary sentence, there are no words wasted. The descriptions in the book – of food, of storms, of island life – are beautiful in a realistic way – it is as if we are there. González is Colombian and this novel originally came out in 1983. But those were the heydays of the other famous Colombian, Gabriel Garcia Marquez, and any new Colombian writer was going to be under the shadow of the master. So, González’ work has been mostly unknown to international readers, till this book got translated a few years back. It was acclaimed when it came out, and I can see why. The last chapter of the book, summarizes the theme of the book and justifies the title – it is brilliant. I loved ‘In the Beginning was the Sea‘. If you decide to read it, I hope you love it too. Have you read Tomás González’ ‘In the Beginning was the Sea‘? What do you think about it? Andrés Neuman is an Argentinian born Spanish author. I am going to consider him Argentinian 🙂 Because I haven’t read any Argentinian author other than Jorge Luis Borges. I loved the premise of this book, ‘Talking to Ourselves‘, and so I thought I will read it. ‘Talking to Ourselves‘ is the story of a family. There is the father, the mother and their ten year old son. The son, Lito, keeps asking the father, Mario, whether he can go on a road trip with his uncle, when his uncle takes out the truck and drives long distance to make deliveries to customers. Mario keeps denying that request, because Elena, the mother is against it. But when Lito, tries it one more time, Mario agrees. When Elena protests, Mario pulls her into the next room, they have a long heated conversation and after that she agrees to the trip. Lito and Mario leave on the road trip while Elena stays at home. We then discover that Mario has a terminal health condition, and as he wants to leave his son with a lasting final memory, he agrees to this trip. And Elena protests, because she is not sure Mario should be going on this trip with his condition and she is also not sure Mario will return from this trip. Lito, of course, doesn’t know any of this. So father and son go on this trip and mother stays home and we hear the story through their respective voices – on the son’s fascination with the trip and the new things he discovers, the things the dad wants to tell the son, and the way the mother copes with their absence and with the impending doom. I loved the three narrators of the story – they were different and unique. My favourite was Lito – his narrative voice was charming and authentic, and made me remember my ten year old self. The truck that they are travelling in is called Pedro and the observations that Lito makes on Pedro are beautiful to read and warm our heart. In the charming voice of this child, Pedro becomes more than a truck and almost a human being with a personality. “…and then it happens again. The sky clouds over. All at once. First I thought it was a fluke. No. No way. I’ve done loads of tests. And it works. If I concentrate really hard, the weather changes. I don’t know who has the power. Pedro or me. But it’s true. Maybe that’s why they gave the truck that name. Wasn’t he the saint who carried around the keys of heaven? I was worried that Dad might laugh at me and all that. I know him so well. I’m glad he takes me much more seriously now. That’s the good thing about being ten and sharing a truck. So I told him about my discovery. Dad tested it too. And he saw it was true. It is so incredibly beautiful to see the world through the eyes of a ten year old child. Elena’s narrative voice was fascinating. She comes through as a complex, flawed, beautiful person. The way she copes with the impending tragedy in her life is by reading books, trying to find nuggets of wisdom in them which will help her cope. And then, one day, she meets her husband Mario’s doctor to discuss Mario’s health condition with him and before long, she starts having an affair with him. She feels guilty about it – cheating on her husband when he has a terminal health condition – but she can’t resist it. Elena’s narrations have some of the most beautiful, contemplative passages in the story. Her thoughts on life, the passages from books she quotes and how she finds them applying to her current situation – they are a pleasure to read. I am sharing below some of my favourite passages from Elena’s narration. Mario’s narrative voice is interesting and adequate. I can’t just ignore him and so here are a couple of passages from his narration that I liked. I loved ‘Talking to Ourselves‘. It is a beautiful, charming, poignant and sometimes heartbreaking story told through three authentic narrative voices. I loved all the three voices and the insights they shared. 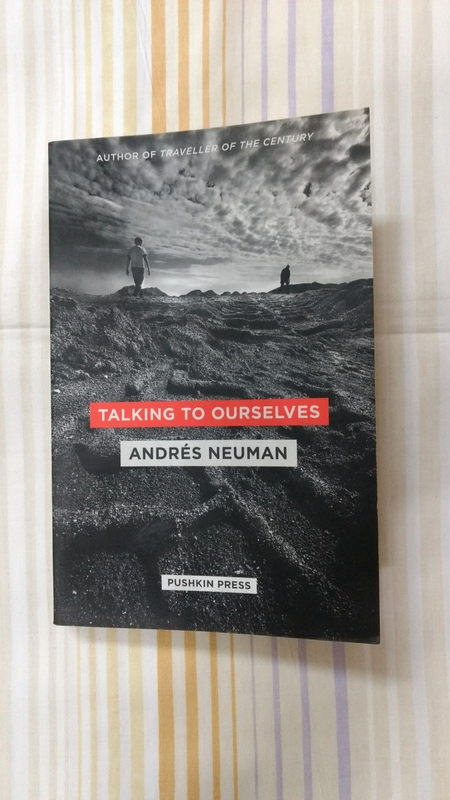 I can’t wait to read my next Andrés Neuman book. His ‘Traveller of the Century‘ is acclaimed and I am hoping to read it soon. Have you read ‘Talking to Ourselves‘? What do you think about it? I discovered Erwin Mortier’s ‘Stammered Songbook‘ when I was browsing through the catalogue of one of my favourite publishers, Pushkin Press. I loved the description of the book and I got it. I started it today and didn’t stop till I finished reading it. Erwin Mortier is from Belgium and Belgium is a strange country because the main language there is not Belgian (there is no language called Belgian), but half of the population speak in French and the other half speak in Dutch. Mortier speaks in Dutch and this book was originally written in Dutch. I think this might be my first Dutch book ever, whether it is Belgian-Dutch or Dutch-Dutch. That realization makes me happy, because it means I accomplished something new today, because I ventured into uncharted terrain. That is uncharted for me at least. 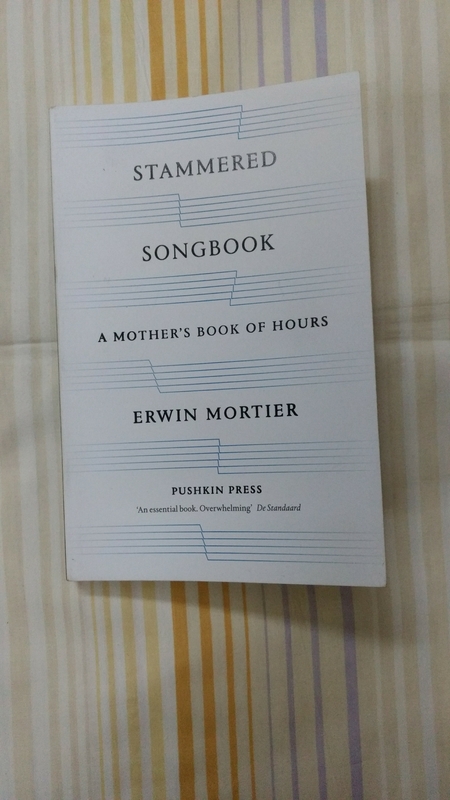 ‘Stammered Songbook‘ is a memoir and it is about Erwin Mortier’s mother. In the book, Mortier describes how his mother got Alzheimer’s, and how she forgets one word – the first word she forgets, sadly, is ‘book’ – and then another and before long she starts forgetting the names of her children and finally she forgets who they are. As she descends from Alzheimer’s to dementia, she transforms into a child, who fears the world around her, and whose emotions become unpredictable, and who is not able to articulate her fears and emotions because she has lost the facility of language. ‘Stammered Songbook‘ is a tender memoir – it is poignant and heartbreaking, but also heartachingly beautiful. It is a love letter to Erwin Mortier’s mother, to language, to memory. Erwin Mortier’s prose is delicate, lush and lyrical, and perfectly compliments the story it tells. In many pages, I lingered over the beautiful lines and read them many times to appreciate better their beauty and the insights they offered. The ending of the book was beautiful and made me remember the ending of the film ‘Amour‘. I am giving below some of my favourite passages from the book to give you a flavour of Mortier’s prose. I loved ‘Stammered Songbook‘. Though it is early days yet, I know that it will be one of my favourite reads of the year. It is a book I would like to read again, to savour the beauty of Mortier’s prose and contemplate on the insights that the book provides. Have you read ‘Stammered Songbook‘? What do you think about it? I rarely read books on contemporary affairs because as soon as the book comes out, it immediately becomes dated, as current events have long surpassed it and left it far behind. 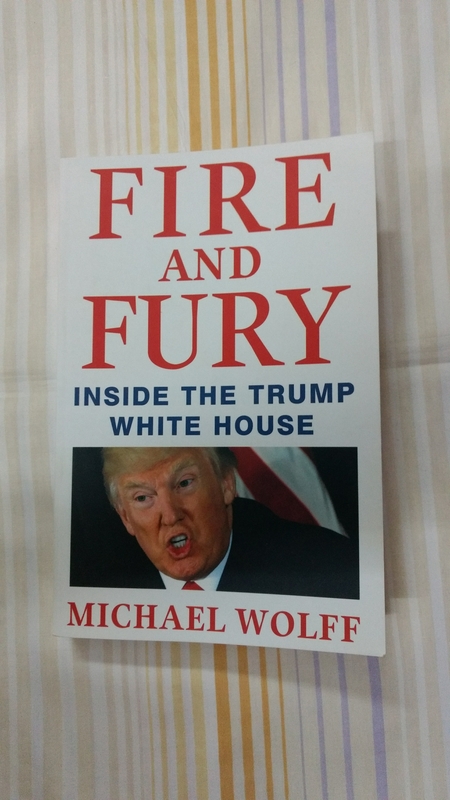 But when I saw ‘Fire and Fury : Inside the Trump White House’ by Michael Wolff at the bookshop last week, I couldn’t resist getting it. I did a readathon the last two days and stayed up late and finished reading it. ‘Fire and Fury’ starts the story from the day the presidential election results are announced in 2016, which results in disbelief in the Trump camp, and goes on to describe the days and weeks of transition leading up to the inauguration, the controversies that start from the day of the inauguration, the fires and controversies which arise everyday after that, many of them lit by insiders including the president himself, and the account continues till around October last year when Steve Bannnon gets fired. During this fascinating journey that Michael Wolff takes us inside the White House, he describes the main players, the relationships between them, the tussle for power and influence among them, the adhoc way things work because of the complicated formal and informal command and power structure. Most of the major controversies – the executive order on immigration, the firing of Sally Yates, Trump’s relationship with Comey and the firing of Comey, the multiple attempts at repealing Obamacare, the Russian affair, Trump’s comments on North Korea – all these and more are covered in the book. Those of us who follow the news closely would already know most of what the book says, but the book tries delving a little bit deeper and tries to show us what happened behind the scenes and the complexity of the events as they unravelled. It is fascinating to read. Michael Wolff’s prose is spare and journalistic and the pages fly. Some of the things I liked about the book are these. Michael Wolff tries as much as possible to stick to the facts and events and avoid judgements. If there are judgements, it is typically one of the characters judging the other. Wolff tries to present things as he saw them or as they were described to him. This results in an interesting experience while reading. For example, when Michael Wolff describes how the much reviled Steve Bannon, ended up becoming the chief strategist at the White House, we don’t really look at him as a bad person. He seems to be someone who never got a free pass – he works hard, he is from a modest background, he worked hard to get a good education, he never succeeded brilliantly in anything he did, but he managed to do reasonably well, his thinking is clear and not fuzzy, and now in his sixties he got an opportunity to do something significant – if we look at him this way, it is hard to hate him. Of course, the courting of the extreme right, the stepping on everyone’s toes and turning the government and all previous policies upside down hasn’t endeared him to many. In another instance, there is a description of a meeting between Trump and the national security team, which I liked very much. It goes like this. For those of us who keep wondering how this man – who gets easily annoyed and angry, who has a very small attention span, who doesn’t care about details, who had a long string of affairs, who cheated on every one of his wives, who probably cheated on taxes, who probably is unethical – got elected as president and got the support of intelligent people, this passage offers insights. When he applies his mind he could get to the core of the problem, he could simplify things to a level that it would be easy to find an answer. He knew how to do this when he wanted, and he knew how to communicate this to his voters and they responded to him. It is unfortunate that the rest of his record and his behaviour and his past weigh against him. There are astonishing things that the book says. Like these. Before running for the presidency, Trump sought his wife Melania’s approval. Melania thought he would win. But his daughter Ivanka thought he wouldn’t, and distanced herself from the campaign and mocked Melania for her encouragement. For a long time, I always thought that ‘liberal’ was good and ‘conservative’ was bad, and I considered myself a liberal. (‘Liberal’ and ‘Conservative’ mean different things in different countries and cultures, of course, and what is conservative in one country might be regarded as a liberal in another. I am talking about the American definition of ‘liberal’ and ‘conservative’ here.) The three conservative positions that I found hard to accept were – antagonism towards abortion and freedom of choice and trying to repeal the Roe vs Wade decision; restricting the rights of people who are LGBT and trying to annul gay marriage; the right to carry arms. In many other issues, I could find good logic in the conservative point of view, though sometimes I may not agree with it. Like, for example, less government intervention in the market, less red tape in bureaucracy, reduction of taxes. Then I discovered that I had friends who probably had a conservative point of view. They were good people. They loved their country and family. And they loved me as a friend. And that led me to think that ‘liberal’ and ‘conservative’ are labels. People are people – they are complex and beautiful. This book describes some such people – people who have a conservative point of view, but who are good people, and who are admirable and hardworking. For example, this is a description of Judge Neil Gorsuch, who Trump nominates to the Supreme Court. And this is a description of Katie Walsh, the White House deputy chief of staff. “Katie Walsh, the White House deputy chief of staff, represented, at least to herself, a certain Republican ideal : clean, brisk, orderly, efficient. A righteous bureaucrat, pretty but with a permanently grim expression, Walsh was a fine example of the many political professionals in whom competence and organizational skills transcend ideology. Most government and political organizations are not run, for better or worse, by MBAs, but by young people distinguished only by their earnestness and public sector idealism and ambition. (It is an anomaly of Republican politics that young people motivated to work in the public sector find themselves working to limit the public sector.) Careers advance by how well you learn on the job and how well you get along with the rest of the swamp and play the game. If there is one person featured in the book, whom I would like to meet in person, it would be Katie Walsh. There is a passage at the end of the book which goes like this. Have you read ‘Fire and Fury‘? What do you think about it?